The metanephric kidney is a mesodermal organ that develops as a result of reciprocal interactions between the ureteric bud and the blastema. The generation of embryonic stem (ES) cell–derived progenitors offers potential for regenerative therapies but is often limited by development of tumor formation. Because brachyury (T) denotes mesoderm specification, a mouse ES cell line with green fluorescence protein (GFP) knocked into the functional T locus as well as lacZ in the ROSA26 locus (LacZ/T/GFP) was used in cell selection and lineage tracing. In the absence of leukemia inhibitory factor, mouse ES cells give rise to embryoid bodies that can differentiate into mesoderm. Culture conditions were optimized (4 d, 10 ng/ml Activin-A) to generate maximal numbers of renal progenitor populations identified by expression of the specific combination of renal markers cadherin-11, WT-1, Pax-2, and Wnt-4. LacZ/T/GFP+ cells were further enriched by FACS selection. Five days after injection of LacZ/T/GFP+ cells into embryonic kidney explants in organ culture, β-galactosidase immunohistochemistry showed incorporation into blastemal cells of the nephrogenic zone. After a single injection into developing live newborn mouse kidneys, co-localization studies showed that the LacZ/T/GFP+ cells were stably integrated into proximal tubules with normal morphology and normal polarization of alkaline phosphatase and aquaporin-1 for 7 mo, without teratoma formation. It is concluded that defined differentiation of ES cells into embryoid bodies with Activin-A and selection for T expression provides a means to isolate and purify renal proximal tubular progenitor cells with the potential for safe use in regenerative therapies. In metanephric kidney development, both the epithelial and the mesenchymal inductive components are derived from the intermediate mesoderm. Onset of expression of Brachyury (T) marks the specification of mesoderm at the time of gastrulation and is transiently expressed from embryonic day (E) 7 to 8.5 in the mouse intermediate and axial mesoderm (1), whereas onset of Pax-2 expression is first seen after gastrulation in the mediolateral mesoderm (2). Development of the mature mammalian kidney results from reciprocal signaling between the in-growing, branching ureteric bud tips and the undifferentiated metanephric mesenchyme that leads to the aggregation and condensation of renal epithelial progenitor cells followed by S-body intermediate formation and finally differentiation of the distinct glomerular and tubular epithelia of the nephron (3). The uninduced metanephric mesenchyme expresses cadherin-11, WT-1, and Pax-2 (4–6), whereas Wnt-4 is expressed in mesenchymal condensates shortly after induction (7). Although there are no known specific single markers of tubular versus glomerular epithelial cell progenitors, expression of WT-1, cadherin-11, Pax-2, and Wnt-4 is a characteristic combination that can be used to define renal progenitor cells (8–10). Embryonic stem (ES) cells that are isolated from blastocysts remain undifferentiated in culture in the presence of leukemia inhibitory factor (LIF) (11,12). When LIF is withdrawn, ES cells give rise to embryoid bodies (EB) that can be induced to differentiate into several different cells types of mesodermal, endodermal, and neuroectodermal lineages, including those that specify hematopoietic, cardiomyocyte, pancreatic, hepatocyte, or neuronal fates (13–19). Although undifferentiated ES cells are multipotent and thus might offer important potential for application in regenerative therapies, a significant drawback of their use in vivo is the common development of proliferative and inflammatory abnormalities, including teratoma development (11). Several strategies have been used to identify renal stem cells, including the use of fetal renal progenitors (20) and more recently ES cells (21–24). Although undifferentiated ES cells that were injected into ex vivo mouse embryonic kidneys and cultured for short periods localized to tubular epithelial structures (22,24), injection of EB-derived cells that overexpressed Wnt-4, under the renal capsule in vivo, formed teratomas (23). Previous studies showed that differentiation of ES/EB cells in specific concentrations of growth factors such as Activin-A or bone morphogenetic protein-7 (BMP-7) can induce endodermal or mesodermal lineage commitment in vitro (16,22). For application for regenerative therapies, it is essential to develop methods to derive specific renal epithelial progenitors that integrate into normal nephron segmental epithelia over long periods of time, without the development of tumors or other abnormalities. In these studies, we used a novel ES cell line with a selectable marker to show that the combination of precisely controlled differentiation and selection results in the isolation and enrichment of specific renal epithelial progenitors that are capable of long-term integration into stable, normally differentiated proximal tubules after a single injection into live mice in vivo. The generation of T/green fluorescence protein (T/GFP) “knock-in” ES cells has been described previously (25). A lacZ-neo fusion gene was inserted into the ROSA26 locus of T/GFP ES cells by homologous recombination (“gene targeting”). The lacZ-neo expression cassette was derived from plasmid pSA-βgeo (26) and consisted of an adenovirus splice acceptor sequence, a β-galactosidase gene fused to the neomycin resistance gene (β-geo), and a polyadenylation site from the bovine growth hormone gene. This cassette was cloned into the unique XbaI site of targeting vector pROSA26-1 (27), in which we had replaced the diphtheria toxin A negative selection cassette by the thymidine kinase gene, giving rise to the final targeting vector pOW-AA. (The complete sequence of pOW-AA can be obtained from H.J.F. upon request.) Plasmids pSA-βgeo, pROSA26-1, and pROSA-5′ (carrying an external probe to confirm correct homologous recombination events) were provided by Dr. Soriano (Fred Hutchinson Cancer Research Center, Seattle, WA). Of 80 neomycin-resistant T/GFP ES colonies, 24 had correctly inserted the LacZ-neo cassette in one ROSA26 allele, giving rise to LacZ/T/GFP ES cell lines. These cells were maintained on gelatin-coated dishes in feeder-free, serum-free (FFSF) medium that contained 50% neurobasal supplemented with N2/50% DMEM/F12 supplemented with B27, 10% BSA, 2 mM glutamine, and 50 U/ml penicillin/streptomycin (all Life Technologies, Rockville, MD), 4.5 × 104 M monothioglycerol (Sigma, St. Louis, MO), 1% LIF, and 10 ng/ml human recombinant BMP-4 (R&D Systems, Minneapolis, MN). For generation of EB, ES cells were dissociated with 0.25% trypsin-EDTA (Cellgro; MediaTek, Indianapolis, IN) and 105 were plated per 60-mm Petri-dish (VWR, West Chester, PA) in differentiation medium that contained 50% neurobasal, 50% DMEM/F12, 2 mM glutamine, 50 U/ml penicillin/streptomycin, 4.5 × 104 M monothioglycerol, 5 μl/ml transferrin (Roche, Nutley, NJ), and 10 μl/ml ascorbic acid (Sigma). EB cells were cultured for 1 to 8 d in the presence or absence of 2 to 100 ng/ml Activin-A (R&D Systems). EB were harvested after dissociation with 0.25% trypsin for 3 min and passed through a 20-G needle before resuspension in (DMEM + 5% FBS (Gemcell, Pennant Hills, Australia). A total of 1 to 2 × 106 cells/ml were analyzed for GFP expression using a FACScan (Becton Dickinson, Franklin Lakes, NJ) or were sorted using a MoFlo cell sorter (Cytomation Systems, Glostrup, Denmark; in Mount Sinai School of Medicine shared facility) to generate cells for PCR analysis or injection into mouse kidneys. RNA was extracted (RNAeasy minikit; Qiagen, Germantown, MD), treated with DNAse, and reverse-transcribed (Sensiscript; Qiagen), and PCR was performed (Hot Star Taqmaster mix; Qiagen) using various primers (Table 1) under the following conditions: 95°C denaturation for 15 min, 30 to 40 amplification cycles (94°C denaturation for 1 min, 60°C annealing for 1 min, 72°C elongation for 1 min), and 72°C for 10 min. PCR products were analyzed on 2% agarose gels. cDNA from E13 mouse metanephric kidneys or adult kidneys were used as positive controls. Genomic contamination of RNA samples was ruled out by omission transcriptase or by the use of water alone. E11.5 kidneys were dissected from outbred CD-1 mice (Charles Rivers Laboratories, Wilmington, MA) using a dissecting stereomicroscope (Olympus, Center Valley, PA), and paired kidneys were placed on 24-mm Transwell Clear membrane inserts, 0.4-mm pore size, in six-well cluster plates (Corning, Corning, NY). A total of 1 ml of supplemented serum-free organ culture medium (50% DMEM, 50% Ham F12, 15 mM HEPES, 2 mM l-glutamine [Cellgro, Mediatek], 4.5 g/L glucose, 45 mM sodium bicarbonate, and 1× insulin/transferrin/selenium [MediaTek]) was added to the lower chamber, allowing a thin film to cover the apical surface of the explant. Kidney explants were injected 1 to 2 h after dissection using an automatic microinjector attached to a Zeiss inverted microscope (Oberkochen, Germany; injection pressure of 100 hPa, compensation pressure of 10 hPa, injection time 0.5 s). Fifteen metanephric kidneys were injected at two sites with 150 LacZ/T/GFP+ cells, and 10 metanephric kidneys were injected with 150 LacZ/T/GFP− cells. In each experiment, the contralateral control kidney rudiment was either uninjected (n = 19) or sham injected with PBS (n = 6). All kidney rudiments were incubated in a tissue culture incubator (5% CO2) for 4 d with daily medium changes. Eighty-five Newborn (2 to 5 d old) mice were anesthetized for 10 s by isofluorane before percutaneous injection of 30,000 cells into the left kidney through a 26-G needle; right kidneys (controls) were uninjected. Thirty-three mice were administered an injection of LacZ/T/GFP+ cells, 32 mice were administered an injection of with LacZ/T/GFP− cells, and 20 mice were administered an injection of undifferentiated LacZ/ES cells. All mice survived the procedure and were observed daily before being killed by CO2 after 4 h; 1, 5, 15, 30, and 90 d; and 6 and 7 mo according to the regulations of the Animal Care Committee of Mount Sinai School of Medicine. Embryonic metanephric kidney explants and newborn kidneys were fixed in 4% paraformaldehyde (PFA; EM Sciences, Pasadena, CA) in PBS (pH 7.4) that contained calcium and magnesium for 4 h and rinsed in PBS three times for 5 min before embedding in paraffin. Five-micron sections were cut, deparaffinized, rehydrated, and stained with Harris's Hematoxylin and Eosin (Sigma); dehydrated in graded ethanols and xylene; mounted in Vectamount (Vector Laboratories, Burlingame, CA); and viewed under a Nikon FXA-Mikrophot microscope using bright-field illumination (Tokyo, Japan). All sections were blinded and viewed independently by three investigators and scored for pathologic characteristics, including glomerular and tubular integrity, presence or absence of interstitial fibrosis, inflammatory reaction, and tumor or other lesions. For β-galactosidase staining, 5-μm sections were deparaffinized, rehydrated through a graded series of ethanols, and incubated for 30 min in 7% H2O2aq to block endogenous peroxidase activity and in 10% normal goat serum in PBS overnight. Sections were then coated with rabbit anti–Escherichia coli β-galactosidase antibody (MP Biomedicals, Solon, OH) diluted 1:500 in PBS that contained 2% BSA for 2 h, washed twice for 5 min in 0.01% PBS-Tween 20 and once for 5 min in PBS, incubated for 45 min with biotinylated goat anti-rabbit IgG (Vectastain; Vector Laboratories), washed twice for 5 min in PBS-Tween and once in PBS, incubated for 45 min with avidin-biotin peroxidase, washed three times for 5 min in 0.05 M Tris-buffered saline, and color-developed for 30 min using red aminoethylcarbazole as substrate (Vector Laboratories). For double immunostaining, after the rehydration and blocking steps, 5-μm sections were incubated with rabbit anti–aquaporin-1 or aquaporin-2 antibodies (Alpha Diagnostic, Caguas, Puerto Rico; 1:100) for 45 min, washed, incubated for 45 min with biotinylated goat anti-rabbit IgG, washed, incubated for 45 min with avidin-biotin peroxidase, washed, and color-developed for 10 min using blue chromogen as substrate (Vector Laboratories). After this first staining, slides were processed for β-galactosidase localization as described previously. For alkaline phosphatase double staining, a 10-min incubation was carried out immediately after the rehydration step using the enzymatic substrate 5-bromo-4-chloro-3-indolyl phosphate/nitro-blue tetrazolium (BCIP/NBT; Vector Laboratories) before blocking and anti–β-galactosidase immunohistochemistry. Cytospin-collected EB-derived progenitor cells were fixed for 5 min in 4% PFA at room temperature or in ice-cold methanol and washed three times for 5 min in PBS, and some PFA-fixed cells were permeabilized with 0.01% Triton. After blocking in 3% BSA for 20 min, the slides were incubated with one or two of the following primary antibodies: Goat anti–Wnt-4 (1:100; Abcam, Cambridge, MA), mouse anti–WT-1 (1/100; Santa Cruz Biotechnology, Santa Cruz, CA), rabbit anti–Pax-2 (1:100; Covance, Princeton, NJ), and goat anti–cadherin-11 (1:100; Santa Cruz Biotechnology) for 45 min. After three 5-min washes in PBS, slides were incubated with one or more of the following secondary fluorophores: Donkey anti-mouse Alexa-488 (1:100; Molecular Probes, Eugene, OR), donkey anti-rabbit Alexa-594 (1:100; Molecular Probes), and donkey anti-goat Alexa-568 (1:100; Molecular Probes). In some cases, DAPI (1:5000; Molecular Probes) or TO-PRO-3 (1:5000; Molecular Probes) was added to the secondary antibody incubation step. After three 5-min washes in PBS, slides were mounted with Vectamount and fluorescence was viewed under a Zeiss Axioplan-2 Microscope (Mount Sinai School of Medicine shared facility). Immunohistochemistry sections were examined using a Nikon FXA-Microphot microscope equipped with Nomarski optics. The mouse LacZ/T/GFP ES cell line that is maintained in culture in an undifferentiated state by culture on gelatin-coated plates in FFSF medium that contained LIF and BMP-4 were converted to numerous, small spherical EB by the removal of LIF and BMP-4. Because mesoderm is specified by T expression (1), FACS analysis was carried out to identify the time point of maximal GFP/T expression in EB after various lengths of time in culture. Figure 1A shows a sharp peak of GFP expression after 4 d of culture. In light of studies showing that specific concentrations of Activin-A can direct lineage-specific differentiation of EB in culture (16), FACS analysis for T/GFP was carried out on LacZ/T/GFP EB that were cultured for 4 d in the presence of 2 to 100 ng/ml Activin-A. Figure 2B shows maximal GFP expression in the presence of 10 ng/ml Activin-A under FFSF conditions. Reverse transcription–PCR (RT-PCR) analysis was then used to determine the gene expression profiles of these optimized enriched populations of EB-derived cells. Figure 1C confirms maximal expression of T after 4 d in culture in the presence of 10 ng/ml Activin-A, as well as the expression of renal progenitor markers including cadherin-11, Wnt-4, WT-1, and Pax-2. However, these cells also expressed Pax-6, a marker of neuro-ectoderm. For further enrichment for renal progenitors, FACS selection of T/GFP was carried out and LacZ/T/GFP+ and LacZ/T/GFP− populations were compared (Figure 1D). RT-PCR expression analysis confirmed that without GFP/FACS selection, the EB-derived cell population expressed cadherin-11, Wnt-4, WT-1, Pax-2, Oct-4, CD24, CD133, and Pax-6 and showed that cell populations that were treated with 10 ng/ml Activin-A also expressed T. Importantly, selection of LacZ/T/GFP+ cells by FACS allowed for the enrichment of populations that expressed renal progenitor markers but not Pax-6 (Figure 1D, lane 3). CD133 was also localized to differentiated proximal tubules in normal E17 fetal kidneys (Supplementary Figure 1). By contrast, FACS-selected Lac/Z/T/GFP− cell populations expressed Pax-6; high levels of Pax-2; and low levels of Oct-4, CD24 and CD133, cadherin-11, Wnt-4, and WT-1 (Figure 1D, lane 4). 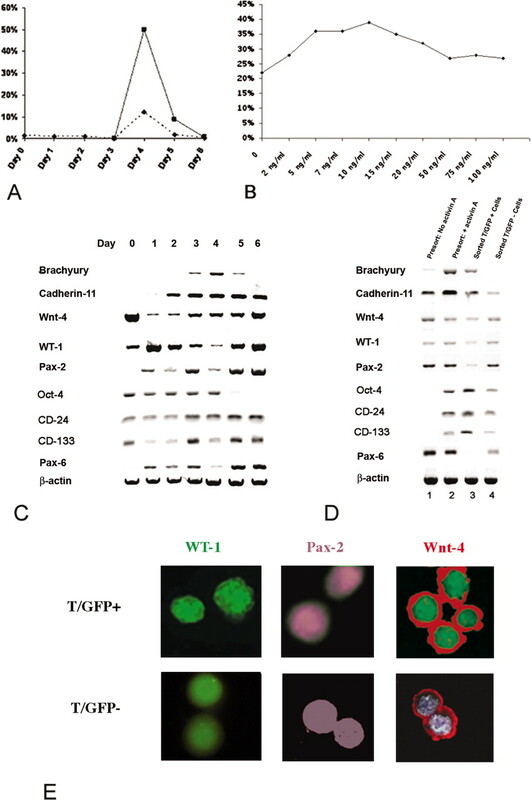 Double immunofluorescence studies showed that both T/GFP+ and T/GFP− cells contained combinations of the renal progenitor cell markers WT-1, Pax-2, and Wnt-4 (Figure 1E). By comparison with DAPI or TO-PRO-3 universal nuclear staining, it was concluded that ≥85% of T/GFP+ cells were Pax-2/WT-1/Wnt-4 positive. These results suggested that FACS selection of T+ cells from EB cells that were cultured for 4 d in the presence of 10 ng/ml Actvin-A effected a significant enrichment of a renal progenitor cell population. By contrast, FACS-selected T cells that were cultured under the same conditions, although not homogeneous, were enriched for renal progenitors that contained high levels of Pax-2 expression. These isolation and enrichment procedures were highly reproducible, showing consistent results in multiple experiments. (A) FACS analysis of brachyury/green fluorescence protein (T/GFP) expression: Effect of days in culture. LacZ/T/GFP embryoid bodies (EB) were differentiated by removal of leukemia inhibitory factor (LIF) in feeder-free, serum-free conditions in the absence (dotted line) or presence of 10 ng/ml Activin-A (solid line) and cultured for 0 to 6 d. Maximal expression of T/GFP was seen after 4 d of culture. (B) FACS analysis of T/GFP expression: Dosage response of Activin-A. EB were cultured for 4 d in the presence of 2 to 100 ng/ml Activin-A. Maximal expression of T/GFP was seen after incubation in 10 ng/ml Activin-A. (C) Reverse transcription–PCR (RT-PCR) analysis of EB: Effects of days in culture. EB-derived cells that were cultured in the presence of 10 ng/ml show maximal expression of T on day 4. Cadherin-11, Wnt-4, WT-1, Pax-2, and Pax-6 were also expressed. (D) RT-PCR analysis of EB-derived cells before and after FACS selection for T/GFP. EB were cultured for 4 d in the absence (lane 1) or presence (lanes 2 to 4) of 10 ng/ml Activin-A. Some LacZ/T/GFP− EB that were treated with 10 ng/ml Activin-A for 4 d were harvested and selected by FACS into T/GFP+ (lane 3) and T/GFP− (lane 4) populations. All cells were analyzed by RT-PCR. Note the absence of Pax-6 from LacZ/T/GFP+ sorted cells in lane 3. (E) Immunofluorescence analysis of FACS-selected LacZ/T/GFP+ and LacZ/T/GFP− cells. Both populations express WT-1 (left, green), Pax-2 (middle, cyan), and Wnt-4 (right, red). Note co-localization of cytoplasmic/membrane Wnt-4 with nuclear Pax-2 and WT-1. Localization of FACS-selected EB-derived LacZ/T/GFP+ and LacZ/T/GFP− cells in embryonic day 11.5 (E11.5) mouse kidneys after 4 d in organ culture. A total of 150 cells were injected at two injection sites per kidney on day 0. Avidin-biotin-β-galactosidase immunohistochemistry of sectioned rudiments. Aminoethylcarbazole (AEC) substrate, red reaction product. (A) LacZ/T/GFP+ cells are seen in the cytoplasm of small undifferentiated blastemal cells in the nephrogenic zone (arrows). The ureteric bud (arrowhead) is unstained. (B) LacZ/T/GFP+ cells are seen (red reaction product) in the cytoplasm of blastemal cells and pretubular aggregates (arrow) adjacent to the tips of ureteric bud (stained light blue). (C) β-Galactosidase staining (red) in the cytoplasm of proliferating cell nuclear antigen–positive cells with dark blue nuclei (arrow) adjacent to the tip of the ureteric bud (light blue cytoplasm). 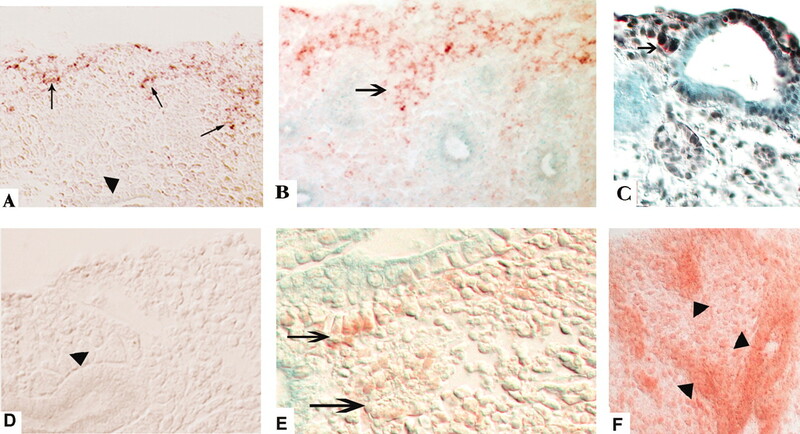 (D) No staining was seen in uninjected contralateral kidneys. (E) CD133-positive cells (red) in cells at the tip of the ureteric bud and in a pretubular aggregate (arrows). (F) LacZ/T/GFP− cells are seen in the ureteric bud epithelium of fetal kidneys (arrowheads). Magnifications: ×40 in A, D, and F (Nomarski illumination); ×60 in B (bright-field illumination) and C; ×80 in E (Nomarski illumination). At E11.5, the ureteric bud has invaded the undifferentiated metanephric mesenchyme and undergone one to two bifurcations. These explants when grown in organ culture in specific supplemented, serum-free conditions undergo normal renal glomerular and tubule epithelial differentiation and morphogenesis after 5 to 10 d (28). These ex vivo preparations were previously used to study the effects of gene manipulation by microinjection (29). For determination of whether optimized EB-derived, FACS-selected Lac-Z/T/GFP+ or Lac-Z/T/GFP− cells could be incorporated into early metanephric progenitor cell pools, E11.5 mouse embryonic kidneys were injected on day 0 with 150 cells at two sites, and their fates were determined after 4 d of organ culture by immunodetection of the distribution of LacZ-encoded E. coli β-galactosidase (Figure 2). After 4 d of organ culture, E11.5 mouse metanephroi show some glomerular differentiation but no clear proximal tubule maturation. Four days after microinjection of FACS-selected LacZ/T/GFP+ cells into these E11.5 metanephric explants, incorporation was seen exclusively in the cytoplasm of small cells in the cortical nephrogenic zone, consistent with the previously reported morphology and distribution patterns of proliferating cell nuclear antigen (PCNA)-positive, cytokeratin-negative blastemal cells at the highly proliferative cortical rim of the kidney (Supplementary Figure 2) as well as at the tips of the ureteric bud, where condensation of epithelial precursors to form pretubular aggregates takes place (5–7,20) (Figure 2, A through C). No staining was seen in the ureteric bud (Figure 2A, arrowhead), and no LacZ/T/GFP+ cells were ever detected in ureteric bud–derived structures. Co-distribution with PCNA-positive, CD133-positive cells (Figure 2, C and E) further suggested incorporation of LacZ/T/GFP+ cells into progenitor cells of a proximal tubule lineage. By contrast, 3 to 4 d after microinjection of FACS-selected LacZ/T/GFP− cells, the majority of staining was seen in the epithelial cells of the ureteric bud (Figure 2F), consistent with the RT-PCR and immunostaining evidence that isolated LacZ/T/GFP− cells express the ureteric bud markers Pax-2 and L1-CAM (Figure 1, D and E; data not shown). Occasional localization of LacZ/T/GFP− cells in the blastema and low levels of expression of additional early progenitor cell markers (Figures 1, D and E, and 2F) might reflect delamination of ureteric bud progenitor cells, but additional studies would be needed for confirmation of this conclusion. Contralateral uninjected (Figure 2D) or sham-injected E11.5 kidneys showed no reaction product after 4 d of culture (data not shown). Because nephron induction is not complete until 2 wk after birth in mice, it was reasoned that renal progenitors that are injected directly into the kidneys of live newborn mice in vivo might integrate into the newly forming metanephric kidney. This new technique allows long-term lineage tracing of LacZ-tagged cells by β-galactosidase immunostaining. After a single percutaneous injection of 30,000 FACS-selected LacZ/T/GFP+ cells into the left kidneys of immunocompetent CD1 mouse pups (2 to 5 d old, n = 33), groups of mice were killed and analyzed by β-galactosidase immunohistochemistry from 1 d through 7 mo after injection (Figure 3). 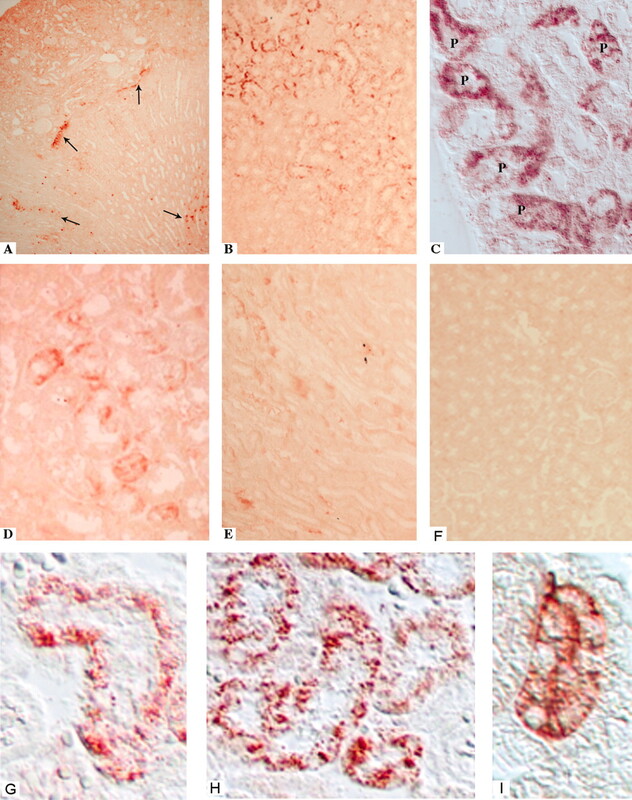 Twenty-four hours after injection, the majority of β-galactosidase immunoreaction product (red staining) was seen in the interstitium (Figures 3A and 4A), whereas by 15 d, it was exclusively localized to some cells incorporated into cortical proximal tubules (Figures 3, B, C, G, and H, and 4B). Similar patterns of proximal tubule incorporation were seen using anti-GFP antibodies (Supplementary Figure 3). Reaction product was similarly detected exclusively in proximal tubules of the cortex and outer medulla 90 d (Figures 3, D and I, and 4C) and 6 to 7 mo (Figures 3E and 4D) after injection. Lack of staining in uninjected kidneys confirmed that the staining was not due to endogenous renal β-galactosidase (Figure 3F). This confirmed that the monospecific antibody recognized only the E. coli β-galactosidase, without cross-reactivity, thus allowing discrimination between endogenous and engineered cells. In addition to β-galactosidase immunohistochemistry, real-time PCR of LacZ expression was used to quantify incorporation in >80% of injected kidneys (Supplementary Figure 4). Distribution of T/GFP+ cells after injection into kidneys of live newborn mice. Newborn CD1 mouse pups were lightly anesthetized, and 30,000 FACS-selected LacZ/T/GFP+ cells were percutaneously injected directly into the left kidney. 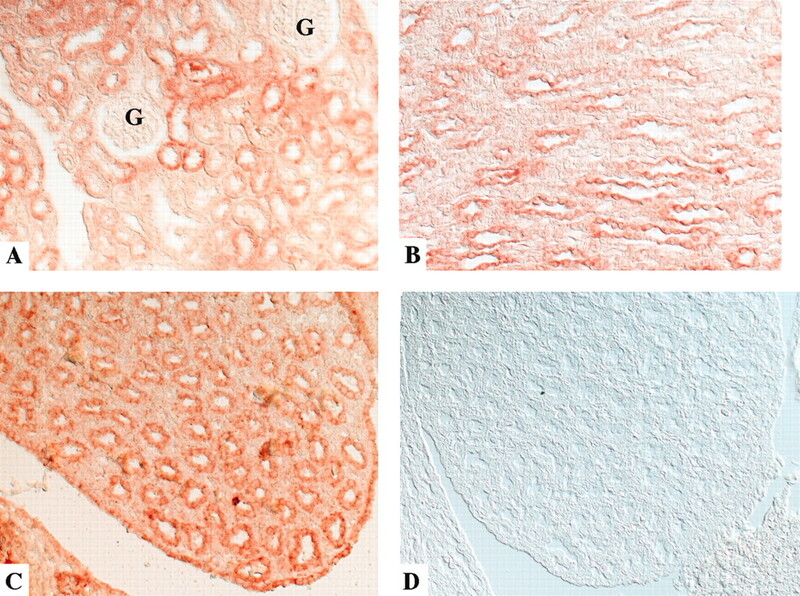 Avidin-biotin β-galactosidase immunohistochemistry of sectioned kidneys, AEC substrate, red reaction product. (A) One day after injection, β-galactosidase–positive cells (arrows) were present in the interstitium. (B) Fifteen days after injection, β-galactosidase–positive cells were present in cortical proximal tubules. (C) High-power image of cytoplasmic distribution of β-galactosidase–positive proximal tubule cells (P) of the outer cortex. (D) Ninety days after injection, β-galactosidase–positive cells were present in cortical proximal tubules. (E) Six months after injection, β-galactosidase–positive cells were present in corticomedullary proximal tubules. (F) No staining was seen in an uninjected kidney. (G) High-power image of β-galactosidase–positive proximal convoluted tubule, 15 d after injection. (H) High-power image of β-galactosidase–positive cortical proximal tubules (S1 and S2 segments), 15 d after injection. (I) High-power image of β-galactosidase positive proximal straight tubule (S3 segment), 7 mo after injection. Magnifications: ×10 in A and F (bright-field illumination); ×20 in B (bright-field illumination); ×60 in C (Nomarski illumination); ×40 in D and E (bright-field illumination); ×100 in G through I (Nomarski illumination). Co- distribution of LacZ/T/GFP+ cells with alkaline phosphatase after injection into kidneys of live newborn mice. Injection conditions are as in legend to Figure 3. Avidin-biotin β-galactosidase immunohistochemistry of sectioned kidneys, AEC substrate, red reaction product. 4-Chloro-3-indolyl phosphate/nitro-blue tetrazolium enzyme reaction for alkaline phosphatase: Blue reaction product. (A) One day after injection, β-galactosidase–positive cells (red) were present in the interstitium. The majority did not co-localize with proximal tubules that express alkaline phosphatase (blue). (B) Fifteen days after injection, some β-galactosidase–positive cells (red) were present in proximal tubules, stained blue at the brush border. No red staining was seen in glomeruli (G), cortical collecting tubules (C), or thick ascending limbs of Henle's loop (T). Arrow denotes the normal connection between the glomerulus and proximal convoluted tubule (C) Ninety days after injection, β-galactosidase–positive (red) cytoplasm was present in some proximal tubules in the renal cortex stained blue for alkaline phosphatase at the brush border. Collecting tubules (C) were unstained. (D) Seven months after injection, β-galactosidase–positive cells (red) were present in the outer medulla in longitudinal profiles of some proximal straight tubules stained blue for alkaline phosphatase. (E) High-power image of junction of proximal convoluted tubule, 15 d after injection, containing β-galactosidase–positive cells (red) and its glomerulus (arrow). Note that glomerulus is unstained. A collecting tubule (C) is also unstained. (F) High-power image of two proximal convoluted tubules, 15 d after injection, containing many β-galactosidase–positive cells (red) and apical membrane alkaline phosphatase (blue). Magnifications: ×10 in A (bright-field illumination); ×20 in B (bright-field illumination); ×40 in C (bright-field illumination) and D (Nomarski illumination); ×60 in E (bright-field illumination); ×100 in F (bright-field illumination). To further confirm that the site of incorporation of the selected LacZ/T/GFP+ cells was indeed proximal tubules, we conducted co-localization studies. Figure 4 confirms a similar time scale of incorporation in that after 1 d, no co-localization with alkaline phosphatase was seen, consistent with initial distribution of LacZ/T/GFP+ cells into the interstitium (Figure 4A). However, after 15 d, all incorporated β-galactosidase–positive (red) cells were seen in alkaline phosphatase–positive (blue) proximal tubule profiles (Figure 4B). This was also seen after 90 d (Figure 4C) and 7 mo (Figure 4D). It was noted, however, that the numbers of β-galactosidase–positive cells within an individual proximal tubule profile ranged from 0 to many (Figures 3 through 5). No LacZ/T/GFP+ cells were seen in glomeruli, collecting tubules, or thick ascending limbs of Henle. Importantly, the morphology of the proximal tubules with and without integrated β-galactosidase–positive cells seemed to have normal connections with glomeruli (Figure 4E, arrow) or narrow or closed lumens, which are characteristic of normal proximal tubules with morphologically intact brush borders and exclusively apically localized alkaline phosphatase reaction product (Figure 4F). Exclusive integration of FACS-selected LacZ/T/GFP+ cells into normally differentiated stable proximal tubules was further substantiated by parallel double-localization studies with the proximal tubule water channel aquaporin-1 and the proximal tubule lineage marker CD133 (Figure 5). Co-distribution of LacZ/T/GFP+ cells with aquaporin-1 after injection into kidneys of live newborn mice. Injection conditions are as in legend to Figure 3. Avidin-biotin β-galactosidase immunohistochemistry: Red reaction product. Aquaporin-1 immunohistochemistry: Blue reaction product. (A) One day after injection, β-galactosidase–positive cells were present in the interstitium. No co-localization with aquaporin-1–positive proximal tubules or thin descending limbs of Henle's loop stained blue. (B) Ninety days after injection, a β-galactosidase–positive (red) cell (arrow) is seen in a proximal tubule with apical and basal membrane staining of aquaporin-1 (blue). Note that aquaporin-1–negative tubules (bottom left) do not stain for β-galactosidase. (C) Co-localization of β-galactosidase (red) and CD133 (blue) in proximal tubules 7 mo after injection. Magnifications: ×10 in A (bright-field illumination); ×60 in B (bright-field illumination); ×40 in C (Nomarski illumination). A similar set of studies were carried out in newborn mice to analyze the fate of optimized EB-derived LacZ/T/GFP− cells after a single injection into the kidneys of live newborn mice (Figure 6). Specific β-galactosidase immunolocalization indicated LacZ/T/GFP− integration into distal tubular structures of the cortex (Figure 6A), into collecting tubule epithelia of the outer medulla (Figure 6B), and especially at the tip of the papilla (Figure 6C). The urothelium was also positive (Figure 6C). No glomerular staining was seen (Figure 6A). Distribution of LacZ/T/GFP− cells after injection into kidneys of live newborn mice. Newborn CD1 mouse pups were lightly anesthetized, and 30,000 FACS-selected LacZ/T/GFP+ cells were percutaneously injected directly into the left kidney. Avidin-biotin β-galactosidase immunohistochemistry of sectioned kidneys, AEC substrate, red reaction product. (A) β-Galactosidase–positive cells were seen in cortical distal convoluted tubules. No staining was seen in glomeruli (G). 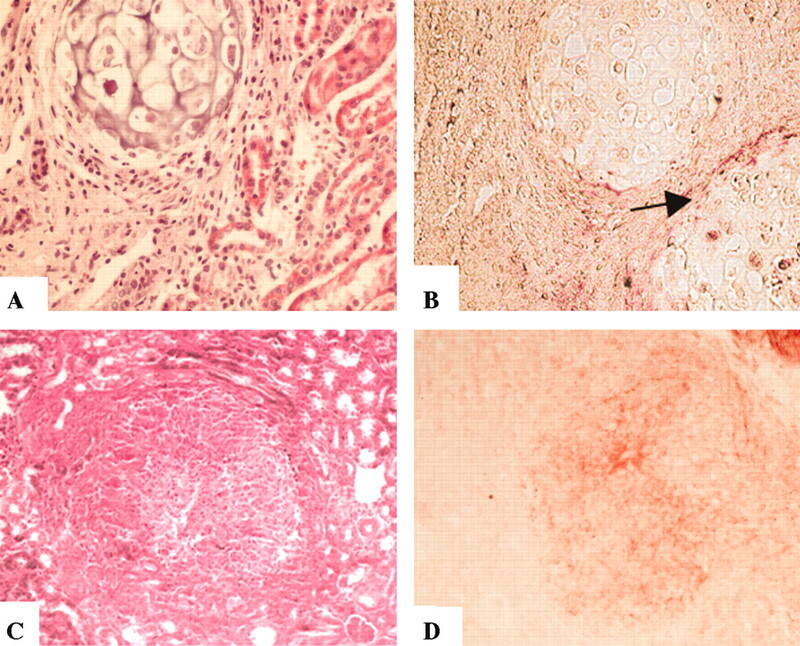 (B) β-Galactosidase–positive cells are seen in medullary collecting ducts (C) β-Galactosidase–positive cells are seen in collecting ducts at the tip of the papilla and in the urothelium. (D) No staining is seen in contralateral uninjected kidneys. Magnification, ×20 (Nomarski illumination). Even though large numbers (n = 33) of immunocompetent CD-1 mice were administered an injection of LacZ/T/GFP+ EB-derived cells during a highly proliferative phase of renal development, no teratomas or inflammatory reactions were seen (Table 2). This contrasted with the results that were seen after injection of the less homogeneous LacZ/T/GFP− EB-derived cell populations, in which four (12.5%) of 32 mice, from day 15 to 7 mo after injection, developed teratomas (Table 2 and Figure 7A) that were β-galactosidase positive (Figure 7B). The injection of undifferentiated LacZ/ES cells resulted in even higher levels of teratoma formation in five (20%) of 20 newborn mice as early as 9 d after injection (Table 2 and Figure 7, C and D). 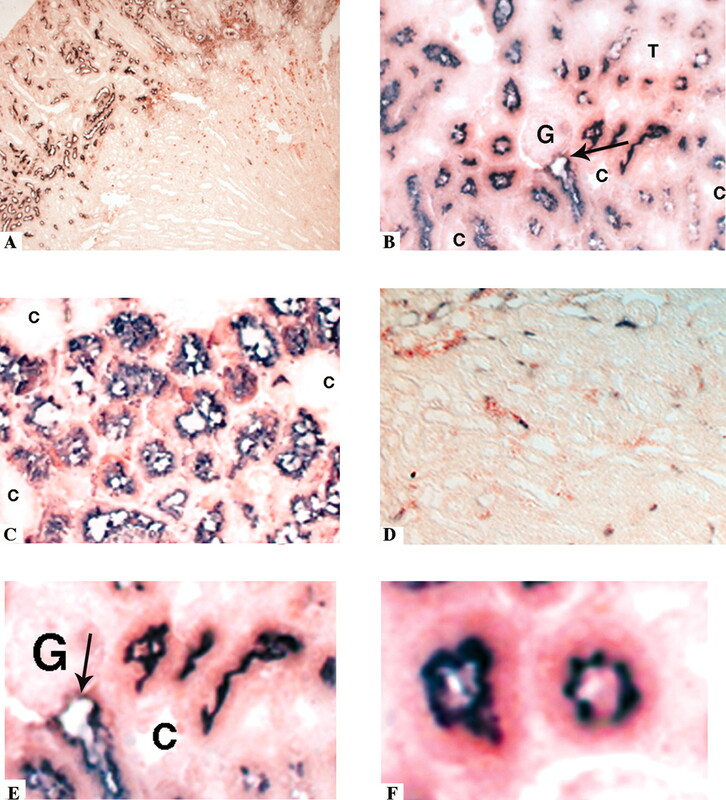 Hematoxylin and eosin (H&E) staining and β-galactosidase immunohistochemistry of teratomas. Avidin-biotin β-galactosidase immunohistochemistry of sectioned kidneys, AEC substrate, red reaction product. (A) H&E staining of teratoma 20 d after injection of LacZ/T/GFP− cells. (B) β-Galactosidase–positive (red) cells in a teratoma 20 d after injection of LacZ/T/GFP− cells (C) H&E staining of teratoma 9 d after injection of undifferentiated LacZ embryonic stem (ES) cells. (D) β-Galactosidase–positive (red) cells in a teratoma 9 d after injection of undifferentiated LacZ ES cells. Magnification, ×20 (bright-field illumination). Because kidney failure is a major cause of morbidity and mortality and demand far outstrips the supply of kidneys that are available for transplant, an important goal in renal medicine is to develop cell replacement therapies. ES cells offer a strong potential, but safety concerns have been raised because of their high propensity to develop proliferative abnormalities, including tumors. Here, we reasoned that the generation and use of committed renal progenitor cells could offer a safer option than multipotent stem cells. To that end, we used ES cells that expressed a selectable mesodermal marker to facilitate selection and enrichment of specific renal progenitor cell populations after optimized limited differentiation into EB with specific growth factors. T/GFP was chosen as the selectable marker because it specifically marks the mesoderm at gastrulation and is expressed during mesodermal specification, including intermediate mesoderm from which the kidney is derived. Members of the TGF-β superfamily BMP-4 and Activin are known to play important roles in mesoderm development (2,30) and to be temporally associated with the gradual downregulation of T and upregulation of Pax-2 during intermediate mesoderm patterning. This reciprocal pattern of high T and low Pax-2 expression is seen in unselected EB that are cultured for 4 d (Figure 1C). Because Kubo et al. (16) had shown that specific concentrations of Activin-A can drive mouse EB differentiation down specific cell lineages, we carried out Activin-A dosage response analysis coupled with RT-PCR gene expression analysis of characteristic renal progenitor markers. Although there is no single specific marker of a renal progenitor cell, a combination of specific markers can be used, including the mesenchymal-specific cadherin-11 (4), WT-1 (5), and Pax-2 (6), all of which are expressed in the uninduced metanephric mesenchyme, as well as Wnt-4 (7), which is expressed in the induced mesenchyme. It is noteworthy that Pax-2 is also highly expressed in the developing ureteric bud as well as induced metanephric condensates, and WT-1 is expressed in differentiating glomerular podocytes. It is important to note in this study that all ES cell maintenance and EB cell differentiation was carried out in the absence of ill-defined feeder or serum factors. This probably contributed significantly to the high reproducibility of the isolations and enrichments observed. Optimization of renal progenitor generation was obtained by the simple manipulations of the length of time in culture (4 d) and addition of a specific concentration (10 ng/ml) of Activin-A. Such a highly reproducible and simple system will be essential for application for therapeutic purposes. Most significantly, the combination of 4 d of EB culture in 10 ng/ml Activin-A with FACS selection based on the expression of the T/GFP selectable marker enabled the enrichment of renal progenitors and elimination of Pax-6–expressing neuroectodermal cell populations (Figure 1D). The sorting of the LacZ/T/GFP− FACS-selected fraction enriched for cells with high levels of Pax-2 expression, consistent with ureteric bud progenitors, although their level of purity remains to be determined. Taken together with the observations that injection of either this LacZ/T/GFP− population or undifferentiated LacZ/ES cells led to teratoma formation, this suggests that purification and differentiation are essential for the generation of normal renal progenitors. Selection based on T expression allowed for enrichment of distinct renal progenitor populations from EB. LacZ/T/GFP+ cells were highly enriched for proximal tubule progenitors and LacZ/T/GFP− cells for ureteric bud/collecting tubule progenitors. This was determined by lineage tracing and distribution analysis of LacZ-encoded β-galactosidase. LacZ/T/GFP+ populations were shown to be proximal tubule progenitors, incorporating into the nephrogenic mesenchyme of fetal kidneys during the early, highly proliferative stages of nephron induction and into stable proximal tubules when injected into newborn live mouse kidneys in vivo, as demonstrated by co-localization with the proximal tubule markers alkaline phosphatase and aquaporin-1 (31). It is of note that the structural profiles of proximal tubules that integrated the β-galactosidase–positive EB-derived LacZ/T/GFP+ progenitors showed normal connections with glomeruli, closed tubule lumens, and elaborate brush borders (Figure 4). In addition, the normal apical membrane polarization of alkaline phosphatase and apical and basal membrane localization of aquaporin-1 further suggested normal differentiation of these tubules. Since the BCIP/NBT method that was used to localize alkaline phosphatase shows activity because it is dependent on enzymatic breakdown of its substrate, this further suggests that these proximal tubules exhibited some normal functions. Injection of renal progenitor cells into live newborn mouse kidneys offers a powerful new method for analysis of integration during development and persistence into adulthood. The specificity and the kinetics of incorporation were highly reproducible. Initially, (4 h to 1 d) injected cells were seen in the interstitium close to the site of injection. During the next week, apparent migration along peritubular tracks (Supplementary Figure 5) toward the nephrogenic zone and integration into PCNA-positive proliferating progenitor cell pools took place, so that by 15 d after injection, cells were seen at their final proximal tubule (T/GFP+) or collecting tubule (T/GFP−) destinations, integrated into maturing tubular structures. This pattern was always seen in successfully injected kidneys: LacZ/T/GFP+ cells were seen only in proximal tubules, never in ureteric bud–derived structures, whereas LacZ/T/GFP− cells were never seen in proximal tubules. The apparent rapid migration of newly injected LacZ/T/GFP+ progenitor cells from their site of injection through the interstitium to the cortex allows the speculation that growth factor gradients and/or extracellular matrix niche environments may contribute to the homing of a specific progenitor cell to a particular locale (32–35). In that regard, it is of interest that many LacZ/T/GFP− progenitors incorporated into collecting tubules at the tip of the papilla, which has been identified as a niche stem cell in the adult kidney (36). Although immunofluorescence cannot be used for analysis of fixed kidney tissues and immunohistochemistry can mask immunoreactivity, the observation that in the majority of cases β-galactosidase staining was present in all cells of a tubular cross-section suggests clonal expansion of incorporated EB-derived progenitors. It is encouraging that integration was still seen in kidneys at the termination of the studies, 7 mo after a single injection. Our studies suggest that it is possible to derive different, monopotent renal progenitor populations from EB. By a combination of culture condition optimization and selection, we have generated a relatively pure population of renal proximal tubule progenitors that are capable of long-term integration into normal nephrons and do not lead to teratoma formation when followed for 7 mo. Ureteric bud progenitors have also been detected, although the conditions for purification have not yet been attained. The lack of integration of either progenitor cell population into glomeruli suggests that different conditions will be necessary to direct differentiation along a glomerular lineage. Our studies also confirm the notion that it is preferable to predifferentiate ES cells in vitro into the desired lineage to reduce the risk for teratoma formation and provide the first step to regenerative cell therapy in response to genetic, ischemic, or toxic insults that target the renal proximal tubule. This work was supported by a fellowship from the French Society of Nephrology (C.V.) and by National Institutes of Health grants P01 DK62345 (P.W. ), RO1 HL71800 and HL48834 (G.K.), and RO1 AG19366 (G.S.). O.W. and H.J.F. were supported by Sonderforschungsbereich 497-Projekt A7. The work was reported in part in abstract form at the International Society for Stem Cell Research; June 29 to July 1, 2006; Toronto, Ontario, Canada. We thank Prof. Jérome Rossert, Prof. Jean-Daniel Sraer, Dr. Stuart Fraser, Dr. Joan Isern, Dr.Valerie Gouon-Evans, Marion Kennedy, Macarena Kattman, and all members of Prof. Keller's laboratory for discussion, guidance, and patience. We also thank Haojiang Zhang for technical assistance in microdissection. Flow cytometry and fluorescence microscopy was carried out with the assistance of the Mount Sinai shared facilities.